"This is thinking outside of the box, literally..."
"A Boy Scout is taught how to use a Swiss army knife at a very early age to be prepared at any moment. With THE SWISS DECK, you will always be ready to DESTROY your audience's mental state. I LOVE this and have since put this in my own walk around set. And the secret is soooooo creative." How long would it take you to find a signed card lost in the deck and locked within the walls of a card box? If your answer was a moment longer than "instantly," you are using the wrong tool for the job. Look no further than Brandon David and Chris Turchi's Project: Swiss Army. From the geniuses who brought you Envylope and Incredihole, comes Project: Swiss Army - a ground-breaking hidden-in-plain-sight utility tool that will forever change the way your spectators experience magic. Imagine being able to add an extra layer of deception to card effects that you already perform, or simply performing one of the multiple effects included. Project: Swiss Army is your secret tool for inducing genuine reactions from your audience! - Time Out: A card is signed, lost in the deck, then placed back into a card box. Immediately pull the selection out before they can even have a chance to name their card! - Utility Strip Out: Any 4-card production can be instantly pulled from the middle of a deck. Use this as an opener to magically get into any 4 Ace Routine or as an impossible standalone effect! - Flick Out: Any card can be lost in the deck, then comes visually flying out with a simple flick of the finger! - Easy Forces: This utility tool allows for the EASIEST card forces unknown to laymen. 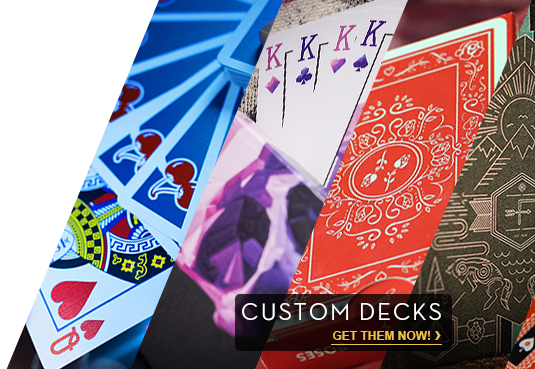 It allows you to handle cards freely without holding any breaks! - Multiple Card Selections: Multiple cards can be forced and found just as easily as one! - Card to Impossible Location: This tool allows you to perform this silently, stealthily, and without any heat! - Swiss Army Tool + Card Deck included! - Less than 1 minute of setup required before you start performing! - Perfect for table hopping or walk around. Resets in a matter of seconds! - No switching required. Same box and deck in play at all times! One tool, limitless possibilities. Join Project: Swiss Army. More products from: Murphy's Magic Supplies, Inc.